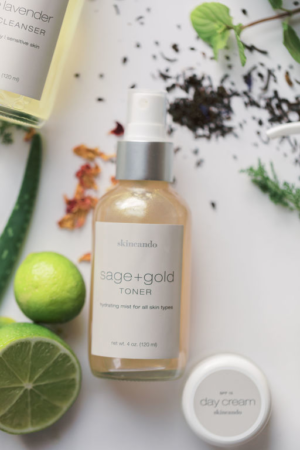 A dreamy organic toner used to clean the skin of residual product and debris after cleansing. This antimicrobial facial mist protects, hydrates and restores the skin’s natural pH. It is important to use a toner after cleansing because it ensures your skin is completely clean of product and hard water residue, which will prevent breakout and will optimize the use of your moisturizer. To use, apply to organic cotton pad and swipe face, neck + chest in an upward motion following the Aloe Foam, Blue Lavender, Pearl Mud or Wild Honey. Can also be used throughout the day to refresh the skin, as an aromatherapeutic boost or to clear stressful energy!